Thanks to this 40' x 240' tent and several others, the construction project was able to complete on time in spite of unusually cold winter weather. We worked with the construction company to move this tent several times to cover and heat the areas where they were working. Our tents allowed this construction project to continue moving forward even during an unusually cold winter. Do you have a construction project that’s running behind schedule due to the weather? Don’t let it get you down. We may be able to put up a tent and rescue your project. Do you need to pour concrete in freezing temperatures or protect your crew from blowing snow? We’ve got you covered. Our heavy-duty construction tents are designed to handle wind and weather. 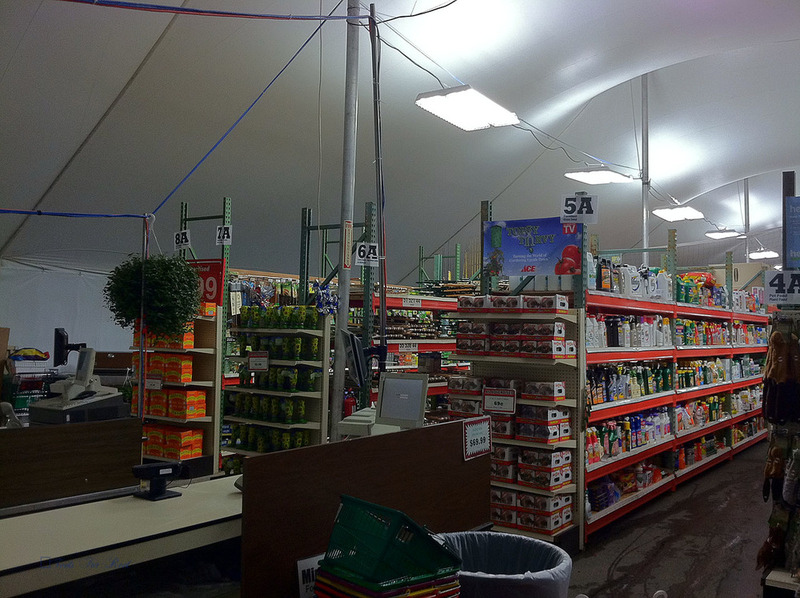 Our propane heaters can melt the snow off the tent roof and keep your crew comfortable. While we can work with uneven ground and obstructions, it’s best to install and remove a tent on relatively level ground with as few obstacles as possible. Will you need work lights for your crew? There’s not much inside when all the tent walls are closed. We’ll need to know the height of any equipment that will be working inside the tent to be sure there is sufficient clearance. In order to give you a price quote, we’ll need to know the length of time that you’ll need the tent. If there is snowfall while the tent is in place, the tent must be heated to melt the snow. Alternately, the snow can be removed manually. 'Can we drive stakes into the ground? If so, that will save you quite a bit of cost. We have two types of tents. Clearspan or frame tents and pole tents. Pole tents are the most economical option. However, if you need completely open space inside, a clearspan or frame tent will work best. For pouring concrete, a pole tent can be used, and the small spot where the pole was can be patched later. Have more questions? We’d be happy to help. Give us a call or get a quote below. Can the tent be secured by driving stakes into the ground? If you have any pictures of the job site, please send them to tents@tentsforrent.net . Do you have any special height requirements for equipment inside the tent?